Attempting to predict any pattern of future trends in technology for the most part is practically impossible to do. Trying to track and then evaluate the new product introductions as well as the progressive forward thinking ideas which has found the backing of angel investors or financiers is almost impossible. It becomes almost a “hit and miss” proposition when attempting to assess whether they’ll even get off the ground. Technology is risky business. Consumers who were shopping for products other than hardcover books or music CDs while online on the Internet, (both of which are now semi-antiquated by the way), was thought of as a ridiculously odd and an unsafe thing to do just a decade ago. But today, shopping by physically going to the mall or one of the big box stores is on the rapid decline. We’re now even purchasing clothing online, which you’d think is almost unimaginable since you would usually want to physically try it on before purchasing. Clothing was actually one item which drew the biggest “scoffs” by the Internet skeptics and was singled out as something that just won’t fly on the web. Wrong. Items such as clothing has been successful because of the sites becoming extremely advanced. You’re now able to view a piece of clothing as well as able to rotate it around to view every possible angle and color. And because these online clothing retailers realize that you can’t physically try them on, their exchange policies are extremely lax. Stores on the Internet as a result has become important virtual showrooms to their customers by displaying their detailed goods on their sites. A new emerging trend is that savvy shoppers will go to a physical store, find a piece of clothing that they like, try it on but not purchase it. They will then go home, search for the product online and order it off the Web instead. It’s also usually for a better price and not necessarily from the same retailer. So the point is that most ideas which were predicted five or ten years ago, such as online ecommerce shopping will eventually overtake “brick and mortar” shopping are actually coming true. So the next biggest and greatest technological advancement is expected to be cloud computing. Not in terms of the industrial type where the company you work for may be currently transforming over to the cloud. 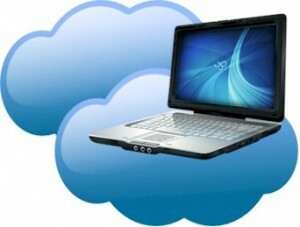 For businesses, cloud computing entails using remote offsite servers which are connected to them via the Internet. This will offer enterprises of all sizes a myriad of advantages, the most notable being gigantic cost and space savings. Nor is the focus on consumer based cloud computing apps which we all take for granted and take advantage of because their usually free. Services such as Gmail, Hotmail, Twitter, Facebook, Flickr, just to mention a few. What has recently been introduced and emerging is a completely new breed of consumer based computers. These devices look like a netbook, but they lack any on-board thinking capability. They basically react as “dummy” portable terminals which connects to Google’s massive “services” which are located in the cloud. Google’s cloud services has reserved an endless supply of disk space for you to use, so you’ll be able to store all of your documents, emails, software or anything else data related, directly on Google’s servers. So having every bit and piece of your data stored somewhere virtual and not on your own PC may sound unsafe as well as a little bizarre. It does however have some advantages. For one, a netbook which doesn’t have a hard drive makes it significantly lighter and quicker as well as the battery’s life and usage being extended. The Chromebook for example offers up to eight hours of usage on a single charge. Another advantage is the lightening quick start-up. While a clogged up Windows computer can easily take up to 90 seconds for it to boot up, a Chromebook is ready for active duty in less than 10 seconds. The security measures which are provide by the Chromebook are also excellent. If you happen to physically lose the device or damage it, none of your personal data will be compromised whatsoever. There’s also no need to worry about updating any software since it’s all done automatically by Google, or worry about any viruses as your data is safely stored in Google’s watchful care. So what then are the problems with this Chromebook idea? One fault is that if you’re frequently away on business or happen to travel a lot, you need to find an Internet connection to be able to function. So say you’re on an airplane or in a remote hotel or cafe where there’s no Wi- Fi availability, then your Chromebook is practically useless. You won’t even be able to work on a simple word processing document or access or send any emails. But Google being aware of this is reportedly planning on offering the majority of its online apps such as Google Docs or Google Calendars and Gmail etc. to be functional while offline in the near future. So a Chromebook is what you get when you marry the productivity of a laptop with the convenience of a tablet PC. But until this movement to the cloud is fully complete and massively adopted, it’s recommended that you still stick with the trusty laptop having all of your data stored on its hard drive.